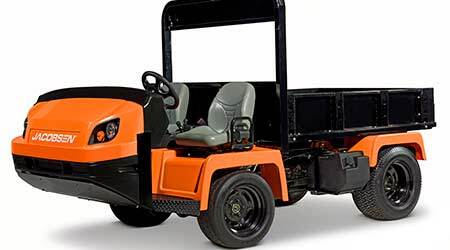 Serving as a replacement for the venerable Cushman® Turf-Truckster®, the turf industry’s original heavy-duty utility vehicle, the all-new Jacobsen Truckster XD sets new standards for capacity, power, strength and comfort. For starters, the new Truckster XD boasts a massive, class-leading 3,550-pound standard payload capacity, supported by the toughest bed in the industry, with steel up to 75 percent thicker than comparable boxes and 20 percent more volume. The gas-model vehicle provides 32.5 horsepower (hp) and 51.6 feet/pounds of torque and the diesel 24.8 hp and 52.7 feet/pounds of torque. Although the new Truckster XD was built to handle the daily rigors of a maintenance crew, Jacobsen engineers also put a priority on comfort, giving the cabin 25 percent more room than the competition.